Normally signs of orchestration on a metal album are like warning signs to me. So when I saw that France's Qantice had a full-time violin player and the albums also included flute, oboe and other instruments I was skeptical. Not that I am against have a diverse sound, but to me having too orchestration can cut into the heaviness of the overall sound. In this instance my fears were quickly pushed away once I actually started the album. The band's Myspace page refers to their music as "movie metal" as they seem to love soundtrack music as well as metal. The overriding sound here is European style power metal that relies heavily on soaring melodies that dominate most of the songs. The quality of the musicianship is high and consistent. The sound does manage to add a degree of texture that other bands of this style don't always have. The orchestration is smooth and is designed to fit in with the spirit and style of the metal parts. There are a few occasions where it sounds like the metal parts are being swallowed by the other instruments. That's a production issue that could easily be fixed on the next go around. Lead singer Vince has a fair amount of range, but gets a little out of tune on some of the highest notes. Still that's just a minor complaint. All in all this was a fairly unique sound and a fine effort. 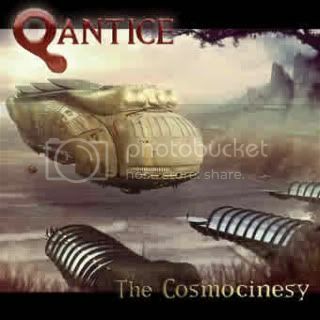 I was half expecting a lot of flourish and little substance, but instead Qantice delivered an intriguing album.